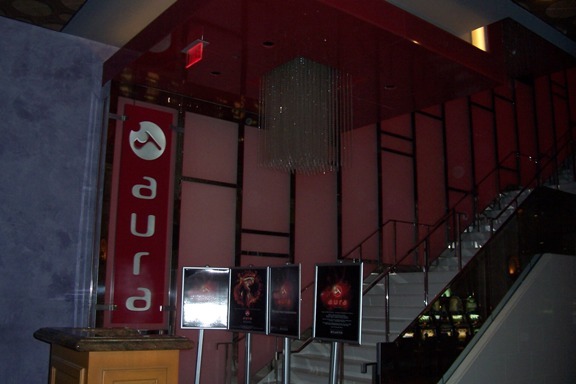 The entrance to the upscale Aura nightclub is in The Atlantis Casino next to the popular Nobu restaurant, whose bar area is another hip hangout. The nightclub itself is upstairs. Models comprise the wait staff and hosts in the 9,000 sq. ft. Aura. The huge dance floor is sunken and reminiscent of the late 70s heyday of disco. Around the dance floor, you can watch the action from either of the two bars or you can reserve a table with bottle service (pricey, starts at about $300). Definitely the place to be seen for the young and beautiful although the red lighting scheme isn’t flattering for everyone. The two sections with the velvet ropes were described to me as ultra-VIP sections. I suppose these places are reserved either for A-list celebrities or the high rollers from the casino. I’m not much of an eagle eye at spotting celebrities, but the Atlantis staff always enjoys telling me who was the unnoticed celebrity that just walked past me. Aura is open Tuesday through Saturday from 9:30 PM to 4:30 AM. The pricing is a bit iffy. If you’re staying at Atlantis, you can enter for free, but if not, entrance is $50 for women and $100 for men. However, I’ve heard that very attractive women are often let in for free. During the week, grab one of the complimentary entry passes from the pile on the table at the foot of the stairs. 18+ can enter with valid ID. Drinks coast about $18-20, with beer slightly cheaper at about $12.